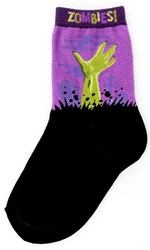 The undead are rising in this scary novelty sock! The green zombie hand is rising out of its black grave on a background of a purple sky and grave stones. I ordered nine pairs of these socks, five women's and four men's, for a family Halloween fest. The socks arrived quickly without issue. The quality and vibrancy of the colors is top notch. I have not gifted the socks to my family yet but I know they will be as impressed as I am with the fun motif and overall quality. 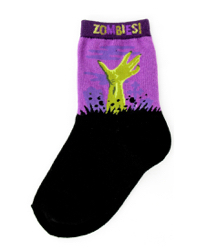 We will all be sporting our zombie socks for Halloween!